I’ve been debating buying an ice cream maker, but I don’t want to buy yet another pointless kitchen gadget that can only do one thing so a friend offered to lend me hers to see if I could come up with things I liked to eat. 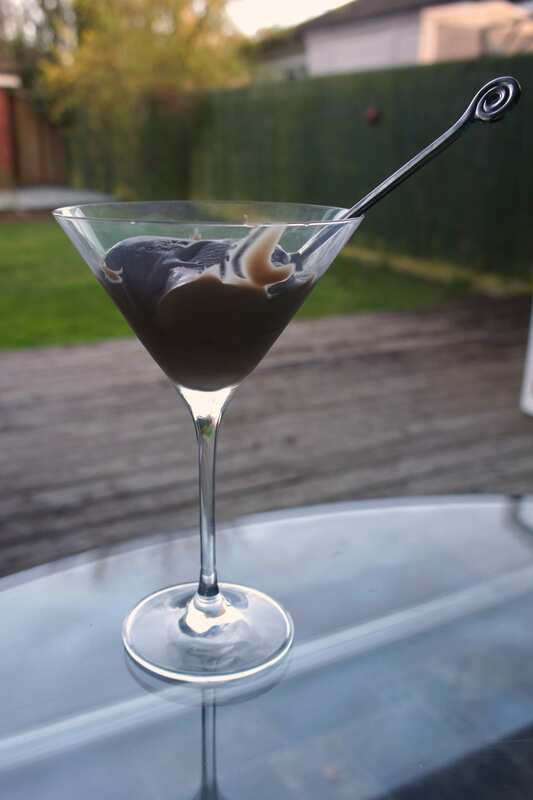 I thought I’d share the three things I attempted to make – I mean…it’s supposed to be summer, so we should be able to eat ice cream all the time, right? First up – well, I had to do something with Nutella because I still have that huge jar of it in the cupboard. This recipe – well, it was so simple, I feel a bit silly calling it a recipe – only has two ingredients, and I already had both of them lurking in the cupboard. I used a can of condensed milk (which I bought to make some dulce du leche sauce for ice cream but hadn’t been bothered yet) and threw that into the ice cream maker, along with a few heaping tablespoons of Nutella (I only ate one myself). It was super sweet, and needed a little extra freezing, but if you like that sort of sweetness, you’d love this. I made a sugar syrup by putting half a cup of sugar in with an equal amount of water into a saucepan and heating it gently until the sugar was dissolved. (Science!). Once it’s all dissolved, add in the juice of a large lime (which I replaced with lemon juice because I had lemon juice in the fridge) and let it cool. (I was super impatient, so I surrounded the jug with ice to cool it quicker!). 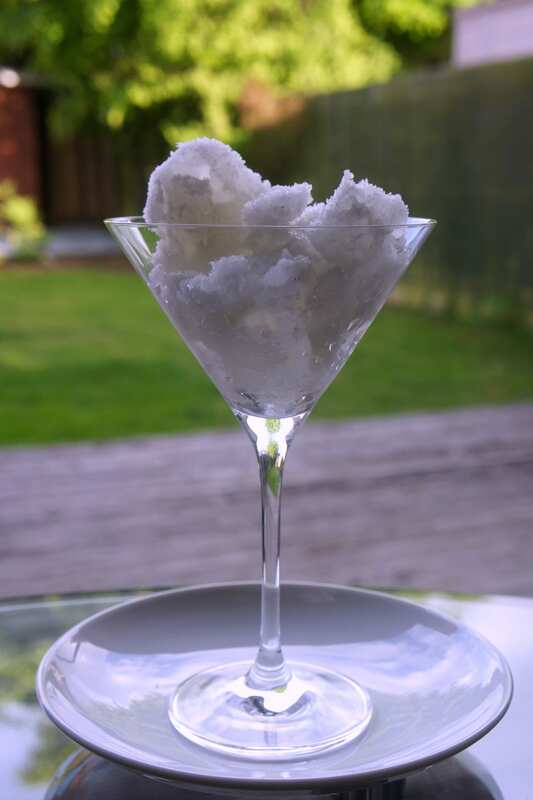 Make yourself a gin and tonic, and then make another one for the sorbet (with about 3 shots of gin and two and a half cups of tonic). When the sugar syrup/juice mix is cool enough, mix with the gin and tonic and taste it. (Then taste it again, I mean, you don’t want this to be horrid) Pour into the ice cream maker and follow the instructions on your maker to make the sorbet. (You’ll be able to tell – it will get slushy at first then will be a bit harder.) If you’re not going to eat it straight away, pop it into the freezer to harden it up a bit more. I think this will be perfect for BBQ’s in the summer…now I just need the good weather and a boyfriend at home for a few weekends! I’ve never been very good at wearing make up. At school, the rule was no make up, which most girls translated to “what’s the least you can get away with wearing”. 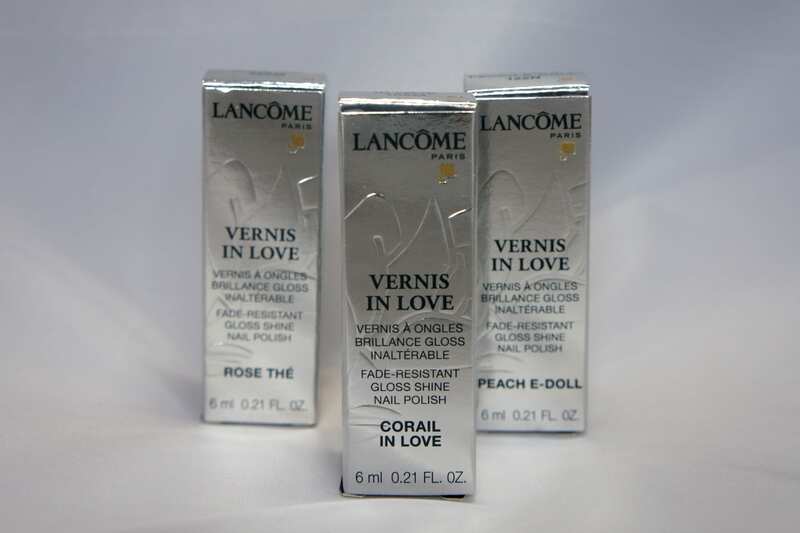 I was such a goody goody – I could just about wear a bit of mascara (brown, so it wasn’t so obvious) and maybe a tinted lip balm (both applied, of course, while on the bus to school). At uni, I’d put on make up for a night out and wipe half of it off because it just felt weird – I didn’t really start wearing foundation until about 5 years ago. But I have always loved buying makeup. Show me a silly claim about how this mascara will make your lashes curl, be longer (not too long though please, I wear glasses, and I hate my lashes grazing the lenses), run faster, jump higher…sorry, gone a bit Lonely Island there. These days, I have a make up bag in my handbag (which I only started carrying about maybe a year or two ago?) 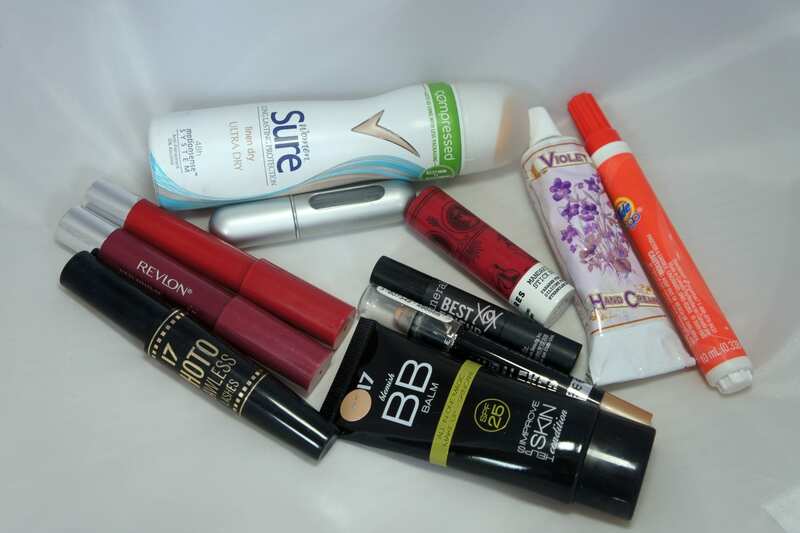 with certain items in that I can apply while on the bus – after 17 years (woe) of practice, I’m pretty good at putting mascara on while the bus is hurtling along the motorway. Something I do like to have though is perfectly polished nails. (Well, mostly perfect. There’s always one nail you wrinkle or smudge). 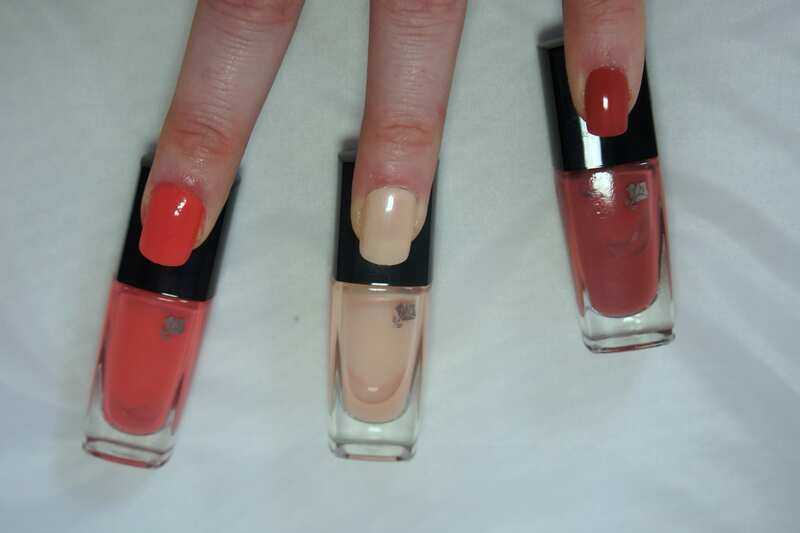 I usually have a pale pale pink on my nails, but when Debenhams got in touch, I let them choose the colours for me and they sent over these three from Lancôme – the middle one (Peach-e Doll) is my favourite (of course) but I love the Corail in Love one as well – coral is such a lovely summery colour! Well, this is awkward, dear blog. I’ve been neglecting you. Ironically, so I can write about blogging. I’m sorry. Let’s be friends again? For those who have no idea what I’m on about, or for those who have missed out on me talking about it (what feels like) constantly on Twitter, I’ve been busy the past few months, and super busy the past few weeks. bonjourblogger.com (and indeed the book) were created because while I love sites like IFB and iFabbo, I didn’t really feel like they were catering to their audiences very well. Both sites assume that all bloggers will want to become professional full time bloggers, but every blogger I’ve asked are just happy to bumble along and if they make some money, awesome! I felt like there needed to be a more central sort of place that bloggers could find out tutorial style things (maybe you’re wondering about how to make a Google map of your favourite places or how to remove the WordPress admin user – which I didn’t really know until I did it recently!) or have discussions that are a bit more than just a tweet or two (like whether you’re disclosing everything you should be). I’d really love it if you followed bonjourblogger.com – and if you have anything that needs to be answered (or you want to give some information out to other bloggers), I would love to hear from you too!